Phyllis was red-faced and damp with anxiety. "Oh, how hot I am!" she said; "and I thought it was going to be cold; I wish we hadn't put on our—" she stopped short, and then ended in quite a different tone—" our flannel petticoats." "You're not"— Phyllis faltered—" you're not going to TEAR them?" "Oh, yes," said Bobbie, "tear them into little bits if you like. Don't you see, Phil, if we can't stop the train, there'll be a real live accident, with people KILLED. Oh, horrible! Here, Peter, you'll never tear it through the band!" She took the red flannel petticoat from him and tore it off an inch from the band. Then she tore the other in the same way. But that doesn’t make the film, or the book, any less iconic. And if you can stay dry-eyed during the final scene where Bobby shouts out ‘Daddy! That’s my Daddy!’ then you must have a heart of stone. There was another TV adaptation in 2000, in which Jenny Agutter moved on to play the mother and Jemima Rooper took her role of Bobby – this was very good too, or perhaps the story is just failsafe. The incident with the train and the petticoats is by no means the climax of the book, although it is often described as such. It is one of a number of linked adventures the children have, and there is a lot to come afterwards. The story is very much of its time (I was surprised to find the word ‘snarky’ in it): a lot of it is about feelings and etiquette and honour and class distinctions, which should sit strangely with the adventures and the penny-pinching, but strangely works out mostly fine, with a bit of a blind eye to some references. It is sentimental to modern tastes, but seen as a historical artefact it is enchanting. 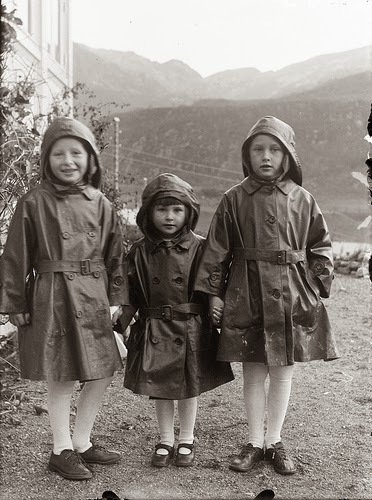 The children are very glad they were given new waterproofs before they moved to the cottage in the country – I found this picture, which shows 3 girls rather than 2 girls and a boy, but it is too delightful not to use on such pedantic grounds. 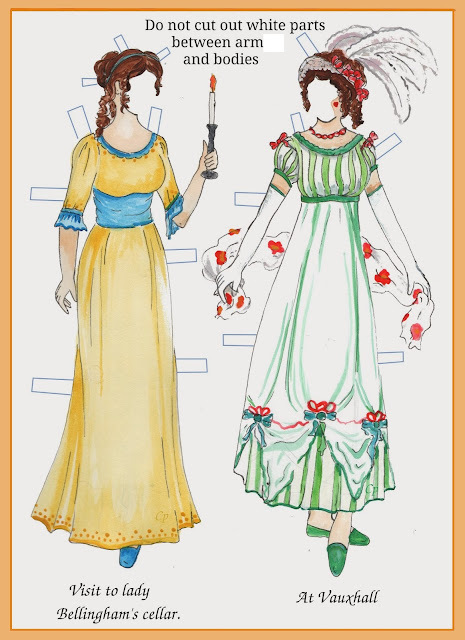 E Nesbit's Five Children and It has featured on the blog, twice (and with petticoats featuring again), along with Jacqueline Wilson's updating of it. Lovely picture of the children. I don't think I have read this book (although I have heard of it of course), nor anything else by this author. Moira - Oh, what a classic story! So iconic. And thanks for straightening that out about the petticoats. Thank goodness we don't wear all those layers any more. I can't even imagine how long it must have taken to dress back at that time. Still, the story is delightful isn't it? I used to have a red waterproof - looking just like the one on the left - as a very small child in the late 1960's and a matching sou'wester. Double-breasted coats were preferred so they could be passed onto my little brother and done up "on the boys' side." 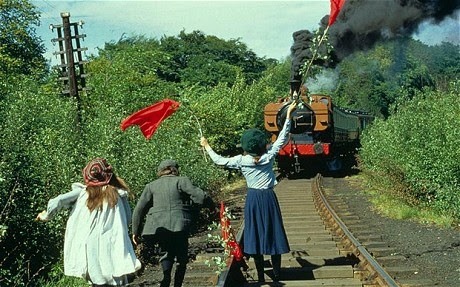 I read the book in my childhood and enjoyed the film. I always had a bit of a crush on Jenny Agutter to be honest. Something her appearance in Walkabout did nothing to quell. You are now officially a chap of a certain age - see comments and piece. There's nothing any of you can do about it apparently. At the risk of sounding totally sexist, she still scrubs up well today - Call the Midwife - though my adoration is somewhat tempered by the nun garb.....too weird!